Group rides should be enjoyable and safe for all participants. We can also be role models for other roadway users. Groups of cyclists are typically the most visible members of the cycling community—we can be billboards for exemplary behavior, or we can reinforce the stereotypes that cyclists are scofflaws. The impressions our actions leave on the motorists we encounter have a tremendous effect on cycling advocacy. Groups of cyclists who run stop signs and red lights, swarm motorists, and cork intersections perform a disservice to the cycling community by undermining the work of ensuring equity for cyclists. 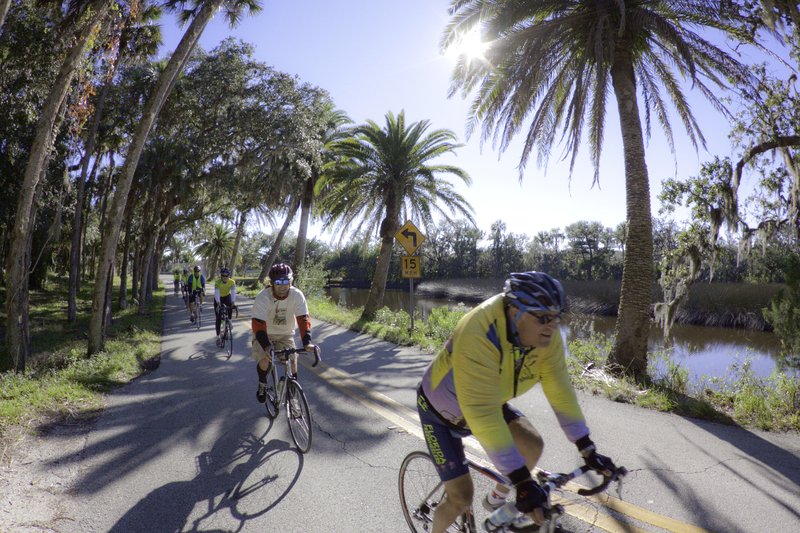 There are several places in Florida where the behavior of some groups has tarnished the image of cycling to the point where local ordinances have been considered which would limit our right to the road. The tabs below offer some tips to improve group safety and enjoyment on club rides. It also contains information for leaders of social group rides, to keep their participants safe and ensure their groups are predictable when they are on the road. Every vehicle driver has a fundamental right of first come, first served. This is the foundation of all the rules of right-of-way. This works exactly the same way on the road as it does in a supermarket checkout line. Respect the right-of-way of other road users. Don’t roll a 4-way stop sign when another user arrived first. Don’t ride to the front of a queue of motorists who arrived first at a red light, interfering with their ability to proceed unimpeded when the light changes. Establish your right-of-way honestly when entering a road. Do not roll out onto the edgeline in front of motorists, expecting them to simply go around you. Wait until it is clear for your group to roll out and legitimately establish itself in the lane like any other driver. Respect your own right of first come, first served. It is not necessary or safe for a group (or individual cyclist) to move out of the way of every overtaking motorist. The group should hold its line in a safe, predictable lane position and expect to be passed safely and courteously as any other slow-moving vehicle. If a significant number of motorists are unable to pass, it is appropriate and courteous for the group to find a safe place to pull over and let that traffic pass (as is expected of all slow-moving vehicles from farm and construction equipment to horse-drawn buggies). This sign applies to the drivers of all vehicles. When approaching a 4-way stop, determine if conflicting traffic will be arriving before the group, communicate with those drivers that you intend to stop and yield right-of-way. By communicating preemptively, you can avoid confusion which delays everyone. DO NOT put your hand out like a traffic cop and expect those drivers to yield to your group! While it’s very kind (or maybe just self-defense) for motorists to wave a group through an intersection, it’s best for group leaders to discourage it by politely refusing the invitation. Stop and yield, as required (first come, first served). Proceed as a group through the intersection. This means all the riders who are together at the stop sign, it does not include riders who may be straggling 30-40ft behind the group. 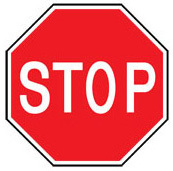 If you did not arrive at the stop sign with the group, you are not part of it. While proceeding as a group is not provided by law, proceeding individually and taking turns with conflicting traffic through a 4-way stop with other traffic would create a massive traffic jam and confusion as turning motorists would end up in the middle of the group. No one wants that, least of all the motorists. At a 2-way stop, cross traffic has the right of way. The best way to manage a 2-way stop is to have the riders approach 2-abreast and clear the intersection 2-by-2, with each pair making their own decision about whether or not it is safe to cross. 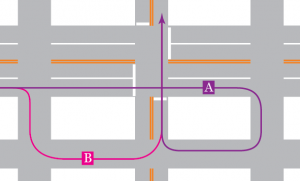 After the intersection, the pairs should slow or stop to wait for all riders to ge through. When making a turn onto a new road from a 2-way stop, the leaders should wait for a a sufficient gap for all riders to make the turn. Decisions to enter the intersection must still be made individually. As always, stopping in double formation at the intersection shortens the group and makes the maneuver easier. It’s a good idea, when planning your route, to avoid situations where the group will have to enter or cross a busy road from a 2-way stop. When traveling straight, use the right-most thru lane—never travel straight in a right-turn only lane. Merge left early from a shoulder or bike lane to prevent right-turning motorists from cutting you off. When turning right, use a right-turn only lane (if one is available) and control it—do not stay in a shoulder or bike lane, this can cause the group to be pinched in the turn by a right-turning motorist. When turning left, use the right-most left turn lane, unless the group plans to make another left turn from the new road. * When the group is traveling through short blocks, it is advisable to prepare for left turns several blocks in advance. This may require the group to stop in a left through lane a block or two ahead of a planned left turn. On one-way streets cyclists may use either the left or the right lane. At a stop, double-up and take control of the lane even if you were previously riding single file. This allows the group to proceed through the intersection as rapidly as possible. When it is time to move, accelerate up to speed (if you are using clipless pedals, cross the intersection before clipping into the other pedal). If single file is warranted, move back to single file after the intersection. Lead riders should maintain a steady pace, accelerating slowly so the group does not get strung out. Likewise, following riders should make sure to gear down before stopping, so they can accelerate efficiently. And learn how to do a power-pedal start so you’re not still paddling through the intersection while the group is in the next block. Should a traffic signal change from green to yellow, a group’s lead rider should alert all other riders and come to a stop (if there is time to do so safely). Only if riders cannot safely stop should they proceed through a yellow light. The lead rider(s) should wait (either by pulling over or slowing down) for others in the group to catch up once the light turns green again. Lead riders can also use the pedestrian countdown signal (if one is present) to determine if it makes more sense to slow or sprint to the light. Note: Lead riders should also apply this principal in other traffic conditions which may result in the group splitting up (e.g., small gaps in oncoming traffic when a group is turning left). Is it necessary? How long is the queue? If the queue is short, it’s almost always better and safer to stay in it. Does the road design permit it? 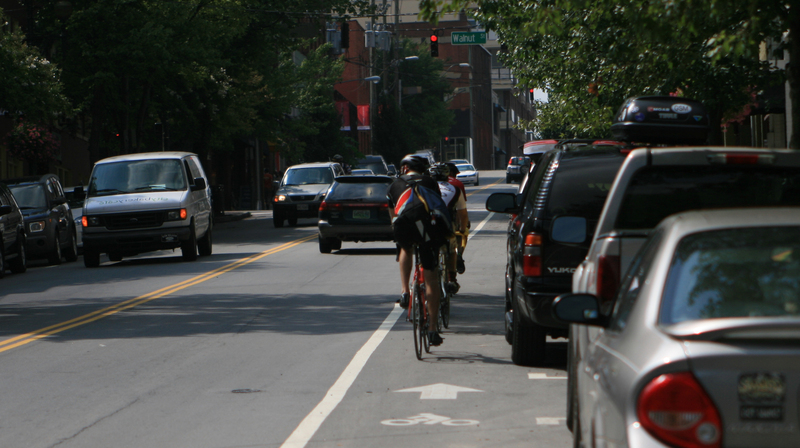 The lane must be wide enough for sharing, or there must be a bike lane or shoulder. Never pass a queue in a narrow lane! Is it safe? Is it possible that a motorist could turn right across the path of the cyclists (at the intersection or any intervening driveways)? Will it cause more problems for the motorists you are passing? Will the group’s presence prevent them from turning right? Will they be able to pass the group easily after the intersection or will your group impede them and violate their right of first come, first served? Never swarm stopped cars (passing on both sides and surrounding them). Never lean on stopped motor vehicles. We shouldn’t need to tell you that. Riding double on a multi-lane road ensures that overtaking motorists recognize, from a distance, that they need to change lanes to pass. A single file group that rides too far right will lure motorists into thinking they can squeeze through in the lane. By the time they realize it’s too tight, they have may have lost their opportunity to easily change lanes. The result can range from angry honking to a high-speed close pass. Your position in the lane should communicate clearly to motorists whether the lane can be safely shared or they must change lanes. Most lanes in Florida are not wide enough to share. If motorists must change lanes to pass you safely, the best way to communicate this is by leaving less than a car-width between your leftmost riders and the lane line or center line. On high-speed multi-lane roads, riding 2-abreast communicates clearly from a distance that motorists must change lanes to pass. It is the safest way for a group to operate on such roads. 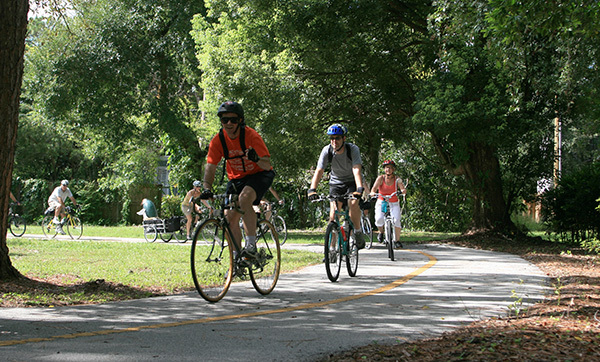 By Florida law, bicyclists may ride two abreast unless impeding traffic (see the Bicycle Traffic Law page for Impeding Traffic Explained). State law is difficult to interpret, and left to the law officer’s discretion as to what impeding traffic means. It is also unclear as to whether a rider may pass two riders abreast, although logic would dictate that this practice is legal. While on a two lane road with wide lanes, if continual oncoming traffic prevents motorists from easily passing, ride in single file or consider splitting the pack into smaller groups. On a two lane road with narrow lanes, be aware that unsafe passing by motorists can happen frequently when riding single file. Depending on the lane width, ride far enough from the right edge of the road to be visible, to have adequate maneuvering space, to avoid surface hazards, and to discourage overtaking motorists from attempting unsafe passes. Riding single allows better maneuverability around surface hazards. On roads with bad pavement or poor sight-lines it is sometime safer to remain single file. For moderate-size groups a double pace line can actually facilitate overtaking by making the group length shorter. See, Understanding Group Lane Position (PDF). There may be times when it is not possible for motorists to pass the group due to road and traffic conditions, such as steady oncoming traffic. If motorists have been unable to pass for a significant time, the group leaders should begin looking for an opportunity to release the motorists. After controlling the lane for several blocks, this group takes advantage of a pull-out area to release traffic that had waited patiently behind them. They offer a friendly wave, which is returned by most drivers. Find a safe place to pull over or make a right turn into a driveway or side street. If the road is of marginal width (12-13ft) and the leader can determine that the right-side pavement is free of hazards, the group may be able to move to the right and allow the motorists to pass slowly within the lane. This is not recommended if there are 4 or more cars back, due to the time it will take them to pass and the potential increasing speed of the later cars. Sometimes you can take advantage of a short stretch of clean shoulder or wide lane to move the group to the right. When doing this, be sure to slow the group (steadily, not abruptly!) in order to allow all cars to pass before you run out of space. Have the rear rider monitor traffic, advise the group and move the group back into the lane. Before changing lanes or position within a pace line, remember to always look behind for traffic (bicycle or motor vehicle). 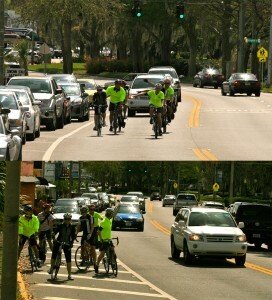 When a group of riders needs to change lanes, it should always be done from the back to the front. 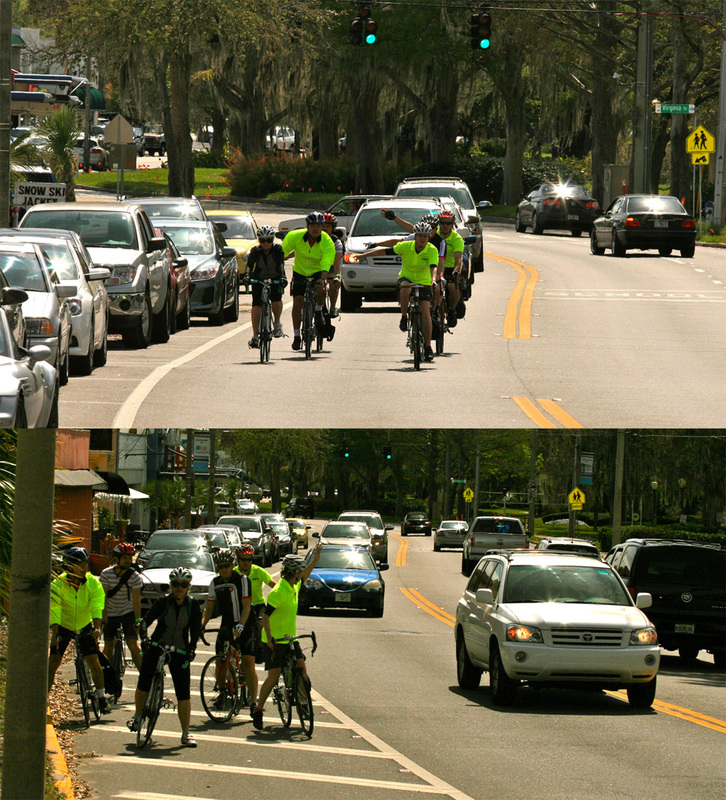 If the lead riders anticipate a need for a lane change, they should signal, following riders should repeat the signal (but not move), then the rear rider should look behind, assess traffic, wait for a gap or negotiate as warranted, then move into the new lane and call forward for the group to move. The group then sweeps from back to front, calling forward to ensure all riders hear the command. See the Sample Pre-ride Briefing tab to learn the simple preparation so all group members (whether experienced or novice) understand the protocol. For a moving vehicle, time is distance. Groups of cyclists need more time to execute lane changes because of the need to communicate and move what is essentially a long vehicle. If you initiate a move too late, the front of the group may encounter a hazard or be past an intersection before the whole group is able to move. Because it’s easier to make a lane change into a gap than to negotiate with drivers who may panic at the notion of being delayed, it’s important to prepare for downstream turns several blocks ahead. 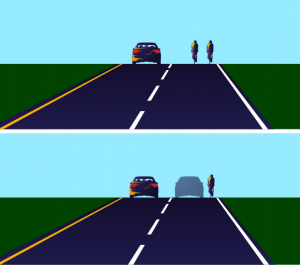 Here are two examples of planning ahead that will make things easier for both the group members and the motorists who encounter it. The above diagram shows a strategic lane selection based on traffic flow. In this case, the primary flow of traffic is onto the interstate. If the group stayed in the right lane, they would be disrupting that flow. A stream of passing traffic would make it harder for them to change lanes as they got closer to the diverge. The video below shows this maneuver in practice. If you are turning onto a road it is a good plan to use a lane that serves your downstream destination. For example, if you are turning onto a 6 lane road from which you plan to turn left in 1/4 mile, just turn into the left-most lane and control it to your turn. This way any traffic entering the road with you will use other lanes. The traffic platoon released from the light behind you will move into the lanes to your right and will probably be passing you at the same time you would have needed to change lanes for your turn. This is much less disruptive for motorists than if they have already changed lanes to pass the group and then the group suddenly wants to change lanes into the one they are in. If you are the rear rider and you know the lane you are in will diverge into a ramp, or the group will need to make a left turn in 1/4 mile or so, that is a good time to monitor gaps in the platoons of traffic. If the next platoon catches you after you have moved, but before the turn, that traffic will simply flow around you in the other available lane(s). Think of your group as a large vehicle which takes time and forethought to maneuver. You would apply these strategies if you were pulling a travel trailer or operating a tractor trailer. 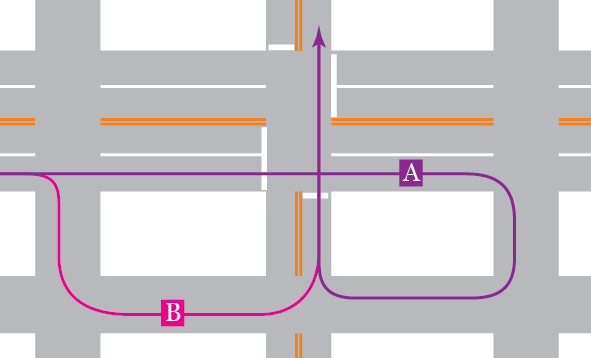 If you need to make a left turn from a major road where there is no left turn lane, no protected signal phase, or where left turns are prohibited, you may be able to make use of an alternative strategy: A) pass the intersection and make a right at the next one to go around the block; or B) turn before that intersection and go around the block (because it involves left turns, B works best if the cross streets have very little traffic). Note: the intersection in question must be signalized. If you are doing an urban ride, try to stick to multilane roads and avoid roads with problematic bike lanes (see the Bike Lane Issues tab). Avoid using 2-lane roads with heavy traffic. If you must use 2-lane roads in urban/suburban areas, go for low traffic (residential) or have a planned release point. A 3-lane road (with a center turn lane) allows for easier passing. If you are using low traffic routes, make sure you have traffic signal protection for the group to enter or cross a major arterial. For left turns from busy roads, make sure you have a dedicated left turn lane and a protected signal phase. If you need to make a left turn from a road without a left turn lane or dedicated phase, consider an alternative left. Sometimes an around-the-block turn can solve the problem (see drawing on right). For easier leadership on the road, plan ahead for your lane change strategies when designing your route. Optimal group size will depend on the type of roads in your route. If you have multi-lane roads with few traffic lights, a larger group will fare well. Keep in mind that once you have too many riders in a line, the riders in the rear have to deal with the yo-yo effect, caused by the amplification of small actions and speed changes near the front. That decreases the enjoyment of a group ride. If you are riding on 2-lane roads where traffic or sight lines will make passing difficult, it is better to keep your group small. A small group has more versatility to ride single or double, as well as to move over and release traffic in a short stretch of wide lane or shoulder. If your large group encounters a short section of 2-lane road, it’s courteous to break the group into several small platoons with gaps between them. Motorists can leap-frog through the gaps and the riders can regroup once back on a bigger road. If a crash or mechanical problem occurs the group should stop, move off the road (unless someone needs to direct traffic around a fallen rider), and assess the situation to determine the appropriate course of action. Do not initiate or reciprocate incivility. If a driver is rude, ignore it or offer a friendly wave. Most of the time it’s just noise and the motorist continues on his small-minded way (a little emptier if he didn’t succeed in getting a rise out of you). Returning hostility can cause escalation. Escalation never ends well. If a driver continues to harass the group, pull out a cell phone. Usually the simple act of showing a phone will cause the errant motorist to disappear quickly. If not, use it to dial 911. Cell phone cameras are also very helpful for getting video and photos of license plates. When possible, alert other riders of potentially dangerous conditions (e.g., dogs, potholes, approaching cars, etc.). If there is a significant obstacle (like a branch or hole that could cause a crash), it is not enough to simply call it. The lead rider should move the group well away from the hazard. This is a good reason to maintain a default position of lane control, so you have space to move the group within the lane and are not pinned in a small area by overtaking traffic. Riders should signal stops and turns, either verbally or by hand. Hand signals should be used to signal movements to other members of the group as well as motorists. Rear riders should make sure their communication to following motorists is clear. Never say “Clear” to other riders approaching an intersection. Each rider must make his or her own decision and learn not to be dependent on the judgment of others, as it may be faulty or conditions may suddenly change. Use discretion in calling “car back.” We know there will be cars back there. Reserve the call for when there is some significance or the group needs to actually do something about it (ie: the lead rider is planning to come off the pull, someone is hanging outside the pace line, or a motorist is attempting to pass unsafely). In a narrow lane, do not move to the edge of the road when a car approaches behind. Hold your line, they can pass when the oncoming lane is clear. If the car cannot pass for a significant amount of time, you may need to employ a release strategy (discussed in the previous tab). When the tracks are angled greater than 90° (120-145°) to the road, cyclists must move right to get a perpendicular angle. This requires yielding lane control, which could encourage a motorist to try to pass. To maintain control, the rear rider should stay left, communicate with motorists as the group crosses. By the time most of the group crosses the tracks, the motorist will understand what they are doing and not try to pass as the rear rider moves right. Crossing tracks that are at an angle of than 90° begin with a lane control position. It’s not as tricky as the group won’t yield lane control until other side of the tracks, but still a good idea to communicate with motorists and discourage them from trying to pass. Railroad tracks can pose a crash hazard. They sometimes have large holes or loose plates, but most commonly tracks that cross the road at an angle other than perpendicular can create a diversion crash hazard. A diversion crash happens when a rider’s wheel slips into a seam or crack. The bike is suddenly shifted away from the rider’s momentum. This kind of crash can be very violent, resulting broken hips or collar bones. Ride leaders should set up a safe angle of approach for the group to cross the tracks. Communication is key. It’s best accomplished by establishing a follow-the-leader protocol. Avoid overlapping your front wheel with the rear wheel of the rider in front of you. Any sudden direction or speed change may result in the wheels touching AND YOU WILL GO DOWN. Be alert! No matter how good a group is, there will be surprises. Avoid using your brakes to slow yourself in a pace line; especially if you are near the front. Control your speed by “soft-pedaling.” Less experienced riders can initially keep to the rear of the line to give themselves time to observe the process. When they join the regular pace line ﬂow they should keep about a half bike length between their front wheels and the riders ahead and decrease the distance as experience and confidence increase. The lead rider takes a short turn (pull) in the front moves to the left side (after checking behind) and drifts back to the back of the pack. New riders may be intimidated about maintaining the pace at the front; they should be expected to take a shorter pull and drop back as soon as it is safe to do so. Unless the group is racing, the new leader should not accelerate when taking over the pull. The leader of a non-racing group should also maintain a constant effort level on grades (slower going up, faster going down). The leader should not coast on a downhill grade—keep your effort up or the riders behind you will be forced to ride their brakes in your draft. Do not ride in aero bars while closely following other riders. Don’t get inside a group that is above your pay grade! When you are expending the majority of you energy trying to keep up, your bike handling skills will suffer. You could become a danger to yourself and other riders. This is not just a problem for sport cyclists riding in pace lines, it is also a problem for the social groups many local advocacy organizations are leading to promote and encourage bicycling. While speed exacerbates the problem, being trapped in a narrow lane is problematic for a group of cyclists at any speed. 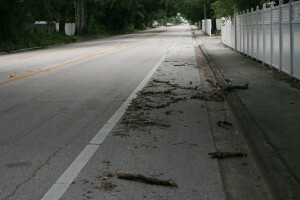 Rocks, sand, sticks, car parts and other such hazards accumulate in bike lanes. These hazards can cause a crash. Bike lanes and shoulders tend to accumulate debris as a natural function of being a place that cars do not use. Debris that falls in the road will be swept by cars into the bike lane or shoulder and once there will not be removed unless municipal street sweepers remove it. As noted in the description of safe, predictable lane-changing (Being Predictable in Traffic tab), the cyclist in the front of a group can’t effectively lead a lane change. But a cyclist in the back of the group can’t see the hazards in the bike lane. There is not enough time between seeing and hitting a surface obstruction for the riders to communicate between the front and rear of the group and negotiate a move into the general travel lane. Many group crashes have been caused by a member hitting a surface hazard in a shoulder or bike lane, or braking or swerving within the group to avoid hitting a hazard. If the first cyclist is doored, all of them will crash or swerve, suddenly ending up in the general use lane. 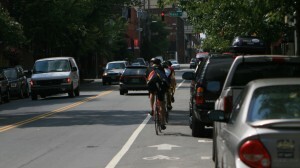 Bike lanes next to parked cars, which encourage bicyclists to operate in the door zone. Bike lanes to the right of right turn only lanes. Bike lanes that jump across diverging ramp lanes. The presence of raised reflectors on the lane line (a common practice, yet a violation of the MUTCD). The hazards created by such lanes are exacerbated when multiple cyclists are riding in close proximity. This is the result of a driver right-hooking a group of cyclists riding in a bike lane. Two cyclists hit the back of the car and others veered into the street. 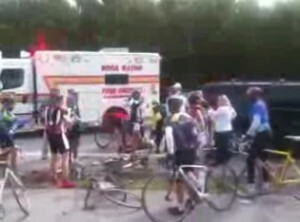 One rider went under the SUV and broke a collarbone. In addition to debris, every intersection and driveway creates a point of conflict and confusion for motorists turning right. Since motorists have a clear path to the point of their turn, they will initially pass the group. But, upon reaching the turn may find their ability to turn obstructed by the front of the group. As a result, they will have to stop and block the thru lane, or they may make a bad judgment call and turn too close in front of the front riders, causing a domino effect of braking and swerving (and a potential crash). FS 316.2065 (6) Persons riding bicycles upon a roadway may not ride more than two abreast except on paths or parts of roadways set aside for the exclusive use of bicycles. Persons riding two abreast may not impede traffic when traveling at less than the normal speed of traffic at the time and place and under the conditions then existing and shall ride within a single lane. 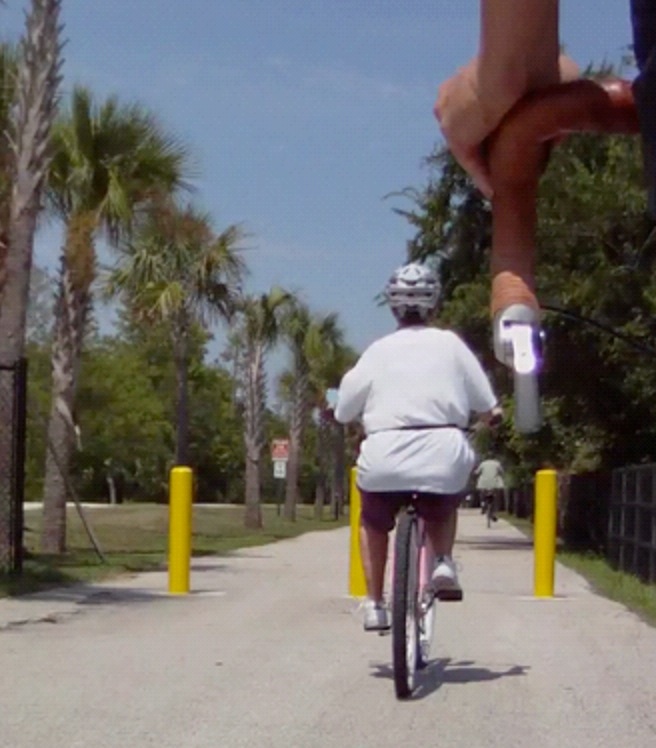 Shared-use paths (MUPs) offer a nice respite from the noise and concerns of motor traffic. It is sometimes appropriate, or even necessary, to lead a group on an MUP, but there are some considerations to keep in mind. Speed. You must share the path with other users of varying speed, skill and predictability. Your group’s speed must take into account courtesy to other users and the ability to react to sudden conflicts. Riding double. On an empty path, it’s nice to ride double and socialize. If there are other users on the path, you won’t be able to do this. In some cases, it may be more appropriate to use a nearby multi-lane road. Hazards. Trails have surface hazards, too, but by far the most common hazards is bollards. Cyclists have been severely injured and killed when their handlebar hooked one of these vertical obstructions. In many cases the cyclists did not see the bollard because it was obscured by the cyclists riding ahead of them. It is very important for group leaders to slow the group, get the riders single file, and very clearly communicate the presence of the hazard. For such hazards, it’s appropriate to ensure communication from front to rear among riders (say “call it back!” or teach this behavior in your pre-ride briefing). When entering and exiting a trail, it is important to get the riders into a single-file formation and slow the group. Trail entries from the roadway often require a sharp right turn, start from a lane control position to ensure a wide arc. A slow, wide arc also allows the following riders time to see and avoid entry hazards like bollards or median curbs. Achieving success on the road requires all group members to have an understanding of what is required of them. Pre-ride briefings should part of every ride start so new riders understand the protocol. The following sample briefing is for social rides where a few leaders will handle the workload of moving the group through traffic. This is a briefing used in CyclingSavvy classes and for social rides that include many novice riders. Two ride leaders. One at the front and one at the back. For large groups, we usually have a few people in the middle who are capable of leading, in case the group gets split or the rear leader has to drop off to assist a participant with a mechanical or other issue. 2 abreast. On most roads, we will ride as a group, 2-abreast in the right lane, unless we are preparing for a left turn or on a one-way street. In a few places we will ride single file. We’ll let you know when we need to single up (hold up index finger to demonstrate that is what the lead rider will do while calling for the group to single up). We never ride more than 2-abreast. Stay together. Ride next to your partner and do not leave a gap of more than a bike length between yourself and the rider in front of you. Riding double is social and enjoyable, but you still need to pay attention to what’s going on in front of you. Potholes or other road hazards. If we encounter a significant road hazard in our lane, the leader will try to steer the group well clear of it, if we cannot, s/he will point out the hazard so the rider behind can avoid hitting it. Pay attention and call out the hazard to the rider behind you. Red lights. The front leader will watch countdown clocks and slow the group, if necessary to keep us from getting split by a red light. If a light changes while part of the group is not yet in the intersection, those who can stop safely, must stop. Do not panic. You still have a ride leader with you. The group that made the light will slow or pull over (depending on the length of the red cycle) and everyone will come back together after you get a green light again. We DO NOT run red lights. We DO NOT cork intersections (corking is illegal). First Come, First Served. We take our place in the right lane and expect motorists to change lanes to pass us. Likewise, we always stop at red lights in the queue, taking our place in line behind whatever cars arrived at the intersection before us. We NEVER jump the queue or swarm cars. The message is We Are Traffic. Lane changes. We change lanes from the rear of the group. When we need to make a lane change, the leader will signal. You must also signal, but do not move until you hear the rear leader tell you the lane is clear. When you hear that call, move to the new lane and call forward so the riders in the front of you hear it. Keep in mind that rear rider may know the route and be monitoring gaps in traffic. In that case, you may hear a call to change lanes without seeing a signal from the front. Interacting with motorists. It is very rare for us to experience incivility from motorists. If it happens, do not react with anger. You may offer a friendly wave WITH ALL FIVE FINGERS. If you can’t manage all five fingers keep your hands on the handlebars. Never shout back. Never escalate. Let uncivil people have their bad karma all to themselves. Stop signs. For most stop signs, we will behave as a single unit. Stopping as a unit, yielding to any vehicles that have the right of way and then proceeding as a unit. There are a few places where this cannot be done. Crossing [busy road at 2-way stop] is one of them. We can’t get a big enough gap in traffic for the whole group, so we will go 2-by-2. Each pair will stop and clear the intersection for themselves. Then the group will collect [at a sensible spot].